If one is a Nitro Funny Car racer, this weekend’s March Meet is the tournament where one makes a statement — and a proclamation of legend. Famoso Raceway’s 52nd March Meet has all the markings of being an epochal event, if not just historic. For the first time in drag racing since the AHRA/PRO National Challenge at Tulsa International Raceway in August, 1973, nearly two score of honest-to-goodness blown-on-nitro AA/Funny Cars will attempt to qualify for a spot in a 32-car eliminator. For Funny Car driver “Nitro Kitty” Mendy Fry, however, merely filing an entry for the race was daunting enough. During her end-of-year racing hiatus, Frau Fry suddenly parted ways with her last team. Similarly, Donnie Couch, her on-again/off-again partner-in-grime (and West Coast Funny Car Factory founder) was himself between projects, kicking the proverbial can against the shop doors, waiting for an opportunity to present itself. None did. Until racecar owner Gary Messenger offered up his dormant (and for sale) Future Flash ’73 Charger, a machine that both Couch and Fry competed with in 2008. A deal was struck: Install a short block, acquire a bunch of odds’n’ends and nitro-strength hardware, buy a drum of fuel and cases of oil, borrow a trailer and get thee to Bakersfield. 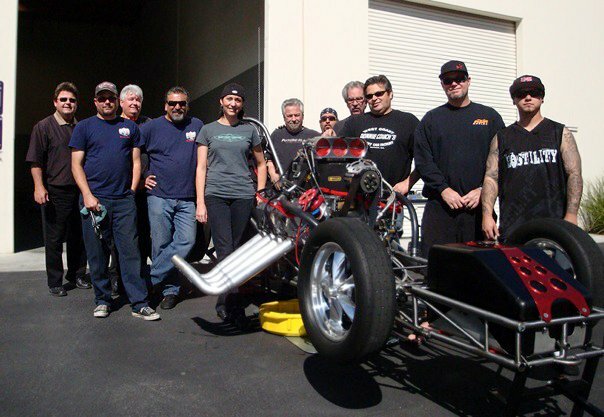 Thus Donnie and Mendy got proactive over the winter, calling in a myriad of favors for donated expendables for their borrowed flopper, now rechristened the West Coast Funny Car Factory/Nitro Kitty Charger. Because of these efforts, this weekend Messenger’s machine will enter the copious cavalcade of fuel coupes jousting for entry in what has the potential to be the mother of all Funny Car races, with Couch turning the wrenches and Fry swapping pedals. Among those ponying up parts, pieces and petroleum products for this bi-partisan, joint effort of Nitro Kitty Racing, Donnie Couch’s West Coast Funny Car Factory and Gary Messenger Ltd.: Hyevon Choppers, Lucas Oil, SCE Gaskets, Molinari, M/T Tires, Justice Bros., Burning Motorhome Promotions and MCC Construction. Advisory March Meet Nitro Funny Car Schedule: 1st round of Qualifying: Friday, March 5th, 2 PM. 2nd round of qualifying, Saturday, March 6th, Noon. 1st Round Eliminations: Saturday, 3 pm. Further eliminations, Sunday, March 7th, 11 AM. Follow the entire event via online streaming at bangshift.com . Track NKR’s efforts at facebook.com/nitrokitty .